With the announcement of his forthcoming fifth studio album, Vermont rocker King Tuff has unveiled the very first single from the record – ‘Psycho Star’ – complete with a weird and wonderful beachside video. Directed by Cameron Dutra, the video is a suburban blend of he bizarre. 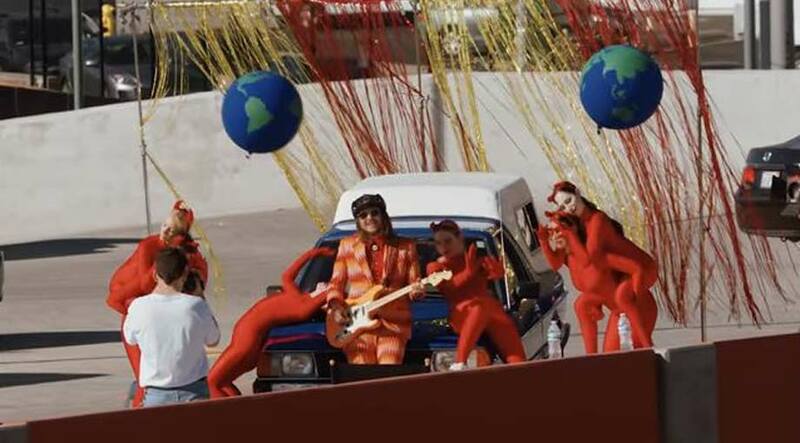 It shoots passers-by on their phones, with imagined dialogue in the subtitles, while King Tuff himself plays guitar in the street in an eccentric red suit with dancers in full spandex bodysuits. Expect his new album, ‘The Other’, to be just as strange yet powerful. It’s the follow-up to 2014’s ‘Black Moon Spell’ and features guest collaborators the likes of Ty Segall, Jenny Lewis, Greta Morgan and Mikal Cronin. Meanwhile, he’s also on tour in the US and Canada from his May 3rd performance at The Casbah in San Diego to his closing show at the Teragram Ballroom in Los Angeles on June 7th. ‘The Other’ will be released on April 13th 2018 through Sub Pop records.